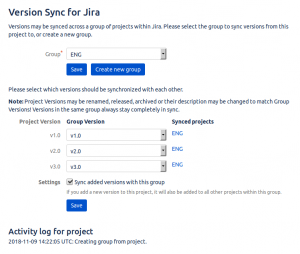 This is the documentation for the Atlassian Jira app Version Sync for Jira. In the menu on the left side, navigate to “Find new apps” under the “Apps” category. Search for “Version Sync”, wait until the entry “Version Sync for Jira” is shown and proceed to “Install” the add-on. After having installed the app from the Atlassian Marketplace, you can start using it right away! 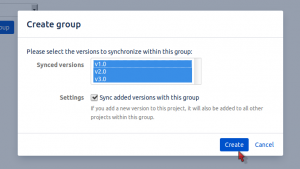 Just navigate to a Jira project of your choice, navigate to its settings and click on the “Version Sync” entry in the navigation bar on the left side. You can change the group this project is attached to at any time. 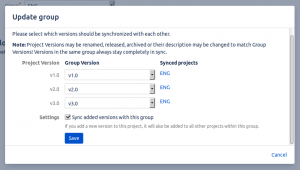 You can also “unsynchronize” any versions or the entire project, or change the automatic sync of added versions within the group. At the very bottom, you can see an activity log where all actions taken by the app are recorded. The same applies if an existing version is changed, released or archived. However, if a version in a group is deleted, the other versions are not automatically deleted, since the version to migrate existing issues into needs to be specified. Thanks for using Version Sync for Jira!